Triathlete, leukemia survivor and writer Steve Brown has released The Inner Triathlete, a collection of multi-sport articles, interviews and short stories that speak to the human side of the sport of triathlon and to the spirit of the triathlete. 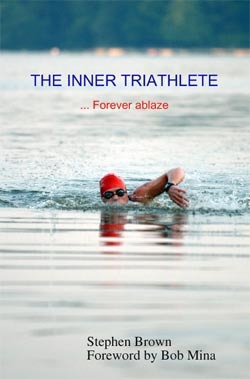 The pieces, previously published by the author over several years, have been brought together as a fund raising effort and dedication to the life and mission of Jon "Blazeman" Blais, the first patient with Lou Gehrig's disease (ALS) to cross the finish line at the legendary Ironman Triathlon World Championship, in Hawaii. Blais won the hearts of millions through the story of his will to live life to the fullest despite the inevitable, nearing end. In May, 2007, he lost his battle with ALS, but Blais' poetry writing and war against the disease is carried on through The Blazeman Foundation. A portion of all book proceeds will benefit The Blazeman Foundation which raises money and awareness to find a cure for ALS. Although not a book about Blais' life, the collection connects with the spirit of the multi-sport athlete, which was evident also in Blais' writing. The book's foreword is written by longtime triathlon writer Bob Mina. Brown, of Philadelphia, has raced, worked and volunteered at hundreds of endurance sports events since 1987, from 5-km to marathon running to Ironman triathlon (2.4-mile swim, 112-mile bike, 26.2-mile run). Over the years, he's also used his racing as a platform to raise funds and awareness for charitable causes. Brown is also a USA Triathlon Regional Board member and a coach with the Leukemia & Lymphoma Society's TEAM IN TRAINING triathlon group. Married, and a father of twins, Brown also finds time to write for regional and national publications, typically on sport and the human condition. The Blais production is his second book. In Brown's first, My New Race, he chronicled his journey from leukemia diagnosis to Ironman finish line. Both books are available through Lulu Publishing, and both benefit the Leukemia & Lymphoma Society. Founded in 2002, Lulu is the world's fastest-growing print-on-demand marketplace for digital publishing needs. Visit www.lulu.com/content/1716091 or www.remissionman.com to preview and order Brown's books.